I spent the morning with Bob Graboyes, Senior Health Advisor, for the National Federation of Independent Business talking about small business and their needs for affordable health care, health insurance. Here's some of my notes from that conversation. * Our health care system is more expensive. And that's because we're wealthier and willing to spend more. * We don't give up on patients. * More expensive care serves to extend useful lives. * We can learn from other countries, e.g., Switzerland and Netherlands with their near 100% coverage without a nationalized system and provided through private companies. * Small business vs big business. It's a case of different rules and regulatory bodies. Big business is subject to Erisa and small business is subject to their state regulators. 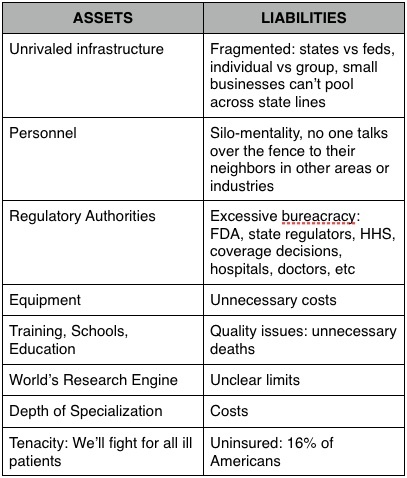 Small business, in effect, has a shallow risk puddle vs the deep risk pool of national companies to balance the risk and costs of providing health insurance for their employees. * Mandates and pay-or-play. NFIB does not endorse either. Why? It's requiring small business to buy something which the current system makes unaffordable. 66% of job growth comes from small business in good times. 100% of job growth comes from small business in bad times. 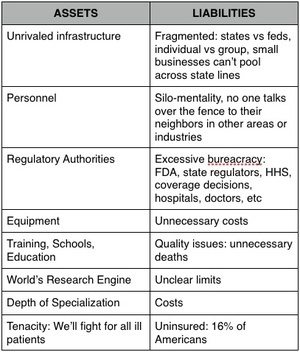 Mandates or pay-or-play chokes this engine of innovation and the resulting job growth with a negative impact. * NFIB's 10 Principles for Health Care Reform. The most important is portability. Why? It allows freedom to live and work at your choice. Portable insurance exists with property, car, fire, insurance. Why doesn't portability exist within health insurance? * Can we fix it? Yes! Germany's universal health care system was created in 1883. It's been fixed every 2-3 years since then. And that will continue. Fixing is and will be a continuous process. * Source of our problems: an embrassment of riches. Since 1972 we've invented some great treatments that deliver better, longer, lives. And our health care costs 5 times what it did in 1972. * When do we not? When do we not continue to provide health care? And who makes that decision? * Prediction for the next 12 months: Fasten your seatbelts.